Do you know exactly where your site traffic comes from? Or which of your campaigns drives the most traffic? If not, read on ;) This post is for website owners who use Google Analytics but want more insight into where their traffic is coming from. Maybe you know how much traffic you’re getting from Twitter, but do you know what percentage of this traffic comes from your Tweets? You can get this data by using Custom Campaigns and adding special tags to your URLs; these tags are called UTM parameters — they are crucial for a deeper understanding of your traffic. UTM parameters are simply tags you add to a URL — when your link is clicked, the tags are sent back to Google Analytics and tracked. With UTM parameters, you can tag your links to gauge the effectiveness of your campaigns and identify the best ways to drive more visitors to your website. Using UTM parameters, you can find out how much traffic came from a particular Facebook post instead of Facebook referrals in general. You can tag your Tweets and compare traffic from your Twitter account to overall Twitter referrals. You can use UTM parameters in newsletters, cost per click (CPC) campaigns, on your blog… the possibilities are endless! I’ll get into more examples below. Let’s analyze the URL above. Pretend you’re an author launching a book. Obviously you want to drive traffic to your book’s landing page (e.g. www.awesome-example.com/book-launch). To understand how much traffic comes from your marketing efforts, you tag your links with UTM parameters. You reveal the book launch to your audience by posting the tagged link on your Facebook page. In the upcoming week, approximately 20,000 visitors come to your landing page from Facebook. Upon checking Google Analytics, you discover that 15,000 visitors clicked your tagged link and the remaining 5,000 visitors came from other Facebook pages and profiles outside your control. By using a tagged link, you know exactly how well your Facebook post performed. Pretty neat right? UTM is short for Urchin Tracking Module. Google acquired Urchin Software in 2005, resulting in the creation of Google Analytics. Instead of a general overview of traffic from your newsletter, you could use UTM parameters to gauge which links and calls to action (CTA’s) are most effective within your email. You could use UTM parameters to compare newsletters over time. You could spot the newsletters that were most effective at driving traffic to your site. You could then hypothesize why certain newsletters were so effective and test your assumptions in upcoming newsletters. Maybe you know how much traffic comes to your product page from your blog, but you want to know which calls to action are driving the most traffic. Again, UTM parameters. utm_source (required) – identify the source of your traffic such as: search engine, newsletter, or other referral. utm_medium (required) – identify the medium the link was used on such as: email, CPC, or other method of sharing. utm_campaign (required) – identify a strategic campaign (e.g. product launch, new feature, partnership, etc.) or specific promotion (e.g. a sale, a giveaway, etc.). utm_term – suggested for paid search to identify keywords for your ad. You can skip this for Google AdWords if you have connected your AdWords and Analytics accounts and use the auto-tagging feature instead. Let’s say you you’re running a Google Adwords campaign for your non-profit WordPress theme. You’d have specific keywords picked out for your campaign. example: utm_term=wordpress-theme , utm_term=non-profit-theme, utm_term=non-profit-template, etc. utm_content – suggested for additional details for A/B testing and content-targeted ads. Let’s say you have three calls to action (CTA’s) on your blog. You have a Hello Bar CTA in your header, a big button CTA in your sidebar and a CTA farther down the page after your blog post but before the comments. Which CTA is sending the most traffic to your product page? UTM parameters are initialized by the question mark “?” at the end of the base URL. Every UTM parameter starts with it’s name (e.g. utm_source, etc.) which is followed by an equals sign “=” which is then followed by the input/argument (no spaces). Each UTM parameter is separated by an ampersand sign “&”. Now that you understand how URLs with UTM parameters are organized, you can create them manually. However, it’s much easier to use Google’s URL builder. Just fill out the form and presto — you’re URL is ready for copying and pasting. Let’s assume that you’ll need to create lots of URLs containing UTM parameters. How would you build your URLs efficiently? How would you stay organized? Google’s URL builder would become tedious fast. *Please Note* The Rafflecopter link tagging tool is a modified version of Epik One’s link tagging tool. Thanks for the awesome spreadsheet Epik One! The credit and applause belongs to you. If you have questions or feedback, please post in the comments below. Extra points for posting how you use UTM parameters (or plan on using them in the future). Jared was previously the Head of Growth at Rafflecopter, the world's easiest way to run a giveaway online. He writes about startups, social media, marketing and productivity. Have to admit utm codes are something that took me longer than expected to get my head around. They make a serious impact to my stats and marketing strategy i use http://www.whysr.com now too an external Urlbuilder which supports Omni marketing. Great post. You can use UTM parameters in newsletters, cost per click (CPC) campaigns, on your blog… the possibilities are endless! I’ll get into more examples below. Google Analytics but want more insight into where their traffic is coming from. UTM parameters in newsletters, cost per click (CPC) campaigns, on your blog… the possibilities are endless! I’ll get into more examples below. 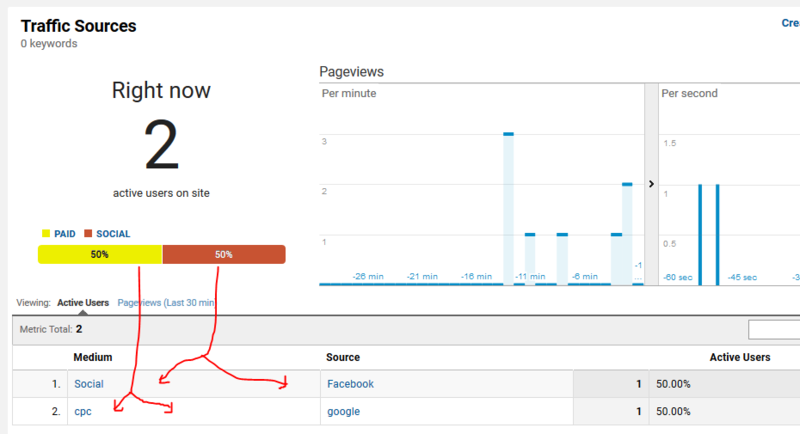 Is there anything I need to do in Google analytics with UTM’s or just building the link do enough? As long as the syntax is correct in the URL and your site has the Google Analytics code on it, that’s all you need to do for GA to collect the site visit data. Great news! I’ll start adding these in today (: cheers for the quick response! Hey Janice, Google recommends using dashes instead of underscores (see this article – https://support.google.com/webmasters/answer/76329?hl=en), except for the utm syntax. Other than that it appears to look OK.
How important is parameter syntax in building the coded URLs? Mostly in UTM links I see source, medium, then campaign. In the Rafflecopter tagging tool, though, it’s ordered with campaign first, then source and medium. It’d probably be easy enough to reorder the formula, but I’m curious if this would even matter. Hey Laura – great question! There is no requirement on the order of each parameter for either Google Analytics or Rafflecopter analytics to record them correctly. Awesome, thanks for the quick response Dave! Google’s URL builder has been my go-to for a while, but now I use Rebrandly’s built in UTM builder which has the ability to save and load presets and then instantly create a branded short link with the UTM parameters built in. Probably saves a good 30 seconds per link.Makes it so you don’t need a spreadsheet! Could you tell me where to fill this url at facebook ad? Alternatively, assuming you are promoting website and the campaign objective is clicks to a website, you could add the parameters manually and use that URL. * Share your short links to Facebook, Twitter, LinkedIn and Pinterest with a single click! Awesome article. Thank you. Btw, have you heard about “Taglynx”? It’s a really cool app for UTM Codes. I like the spreadsheet. I used a similar one some years ago in Excel. Nowadays I would also work in Google Sheets to share it with colleagues. Last year I started to develop a custom URL Builder that solved a key issue I had when working with multiple team members: Consistency. I just preset certain UTM values in dropdowns from which everyone can select the right ones resulting in very tidy campaign reports in Google Analytics – no more duplicate entries for email and Email. You can check it out at http://www.linkdolphin.com. Maybe it’s even an idea to make the UTM values selectable from dropdowns in your spreadsheet, too. In my opinion it’s really important that a consistent naming is used because otherwise the campaign reports will be difficult to read. Hey Oraprofiles – that can get tricky. As you probably read above, there are 5 recognized UTM parameters including utm_campaign, utm_source, utm_medium, utm_content, and utm_term and you can add any value you want to any one of those parameters. Where it can get tricky is “Google policies mandate that no data be passed to Google that Google could use or recognize as personally identifiable information (PII)”. So, if client-id can be PII, then you shouldn’t add it as a UTM parameter. Hey Ankit, unfortunately I’m not all that familiar with Drupal. It may be because your are only local and the parameters aren’t reaching Google. My apologies I can’t be of more help. Hello Jared, I have only google ad-sense account not a ad-word, but some time google analytic show me (Paid User is come). so what is the effect of paid user on my ad-sense account. Good. But what does “UTM” stand for? GA tracks that by default based on the device’s user agent. Hi Jared Polavika, I loved your article about “Intro to UTM Parameters and Best Practices”. But I have a few doubt about this. Hi Jared Polavika, It was very informative article. I followed your article and now I know more about my traffic. Like, Location, Device, Browser and more and thanks for sharing such a wonderful article.